I’d like to add a new feature here, which I’m going to call Tiny Fail. They are the little things that cause a small amount of annoyance to the people that use our websites. First up, 37Signals. I’m a big fan of theirs. We use Basecamp here at John Carroll University and it’s really helped up re-organize. I’ve got Rework and learned a ton from it. We’ve just started working a design firm to help us redesign the JCu website. 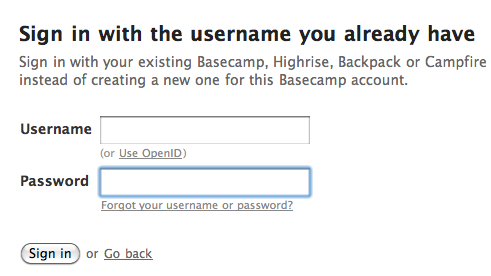 They use Basecamp, and added me as a user. The ability to have accounts in multiple Basecamp instances is nice, and they do a good job of letting me switch between accounts. It’s clean and easy to use, but there’s a tiny fail. The “Use OpenID” is the link that’s tabbed to after name. 99 times out 100, tabbing takes you to the next form field. I fill out so many login forms a day, I type in my username, tab, type password, and hit enter. I did it this morning, only slightly paying attention. Before I knew it, I was taken to an OpenID page. I had to go back a few screens and start again. Why not move the OpenID login choice near the submit button, so that if someone is looking for that method of sign-in, it’s there, but it doesn’t interfere if I want to quickly enter my existing credentials. Just a little thing that bugged me this morning. Previous Previous post: How long should our online videos be?